This is Ellie Mae-I outbid the meat man to get her off the slaughter truck. She has a deep scar on her shoulder and is completely blind in her left eye. This horse is a HUGE lesson to anyone giving their horse away. I talked to the original owner yesterday. She rescued her as a yearling from a PMU farm in North Dakota. She already had the shoulder injury but was sound. Her husband died 2 years ago and she fell into financial distress. 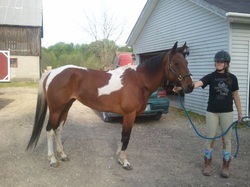 On May 2, 2012, she gave this horse to her farrier who promised her he would find her a terrific home. She was brought to the auction by the Amish on May 19, 2012. I asked the previous owner how long she had gotten that eye injury and she said "What eye injury"? We can only guess what happened to her, but it appears she suffered some kind of severe trauma to this eye. The previous owner was completely heartbroken this had happened to her horse at the hands of her trusted farrier. I almost didn't go to the auction that night. Now I'm glad I did. This horse is here for a reason. She has literally dodged a slaughterhouse twice in her 8 short years. Even with her recent left side blindness, she is the KINDEST and QUIETEST horse I've handled in a long time. She is trusting and in your pocket, absolutely loves everybody she meets. I'm completely amazed how NOT spooky she is, even on that blind side. UPDATE-Vet came and said she should make a complete recovery within two weeks, although this is an extremely painful injury caused by major trauma. This isn't the kind of injury a horse gets just by banging it's head, this is TRAUMA most likely done on purpose. Ellie will be available for adoption after quarantine. 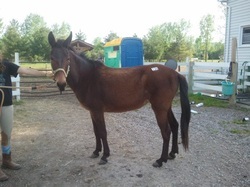 How does a registered Mule from California end up at an auction like this in Michigan? Unfortunately, we'll never know, but the only ones who wanted her were the meat man and me and I won her for a mere $60.00. She's been very well taken care of, stands about 14.2 hands and is supposed to be a driving mule. She was sold as greenbroke. UPDATE-Vet examined her and gave her a clean bill of health. She is very sweet, kind and easy to handle. She will be available for adoption after quarantine.